Telecommunications satellites for two loyal Arianespace customers – Arabsat and the Indian Space Research Organisation (ISRO) – were launched today on the company’s sixth Ariane 5 flight in 2015, bringing to 69 this workhorse vehicle’s string of consecutive successes. Ariane 5 orbited the Arabsat-6B (BADR-7) and GSAT-15 payloads from Europe’s Spaceport in French Guiana during a flight lasting approximately 43 minutes, and in doing so, continued Arianespace’s record mission pace in 2015 with its full launcher family – which consists of the heavy-lift Ariane 5, medium-lift Soyuz and lightweight Vega. 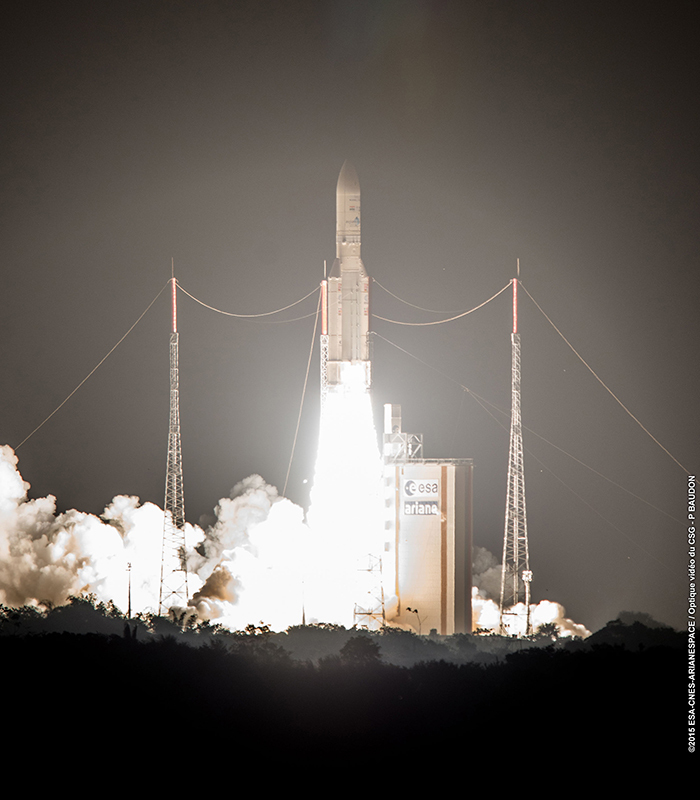 The Ariane 5 flight with Arabsat-6B (BADR-7) and GSAT-15 marked the workhorse heavy-lift vehicle’s 69th consecutive success. “Launch after launch, we are demonstrating our capability to increase our operational pace while remaining the most reliable solution for all our customers,” said Arianespace Chairman and CEO Stéphane Israël, who provided his post-flight comments from the Spaceport’s mission control center. - Perigee: 246.9 km. for a target of 247.1 km. - Apogee: 35,884 km. for a target of 35,884 km. Designated Flight VA227 as the 227th launch of an Ariane-series launcher to date, today’s heavy-lift success continues long relationships of trust between Arianespace and the mission’s customers. Arabsat-6B (BADR-7) was lofted for Airbus Defence and Space and Thales Alenia Space as part of a turnkey contract with Saudi Arabia-based Arabsat – for which Arianespace has launched eight previous spacecraft since 1985. In addition, it is the 113th Airbus Defence and Space-built satellite to be orbited by Arianespace. Arabsat was represented during the post-launch comments by the company’s Chief Technology Officer and Vice President, Mueid Al-Zahrani – who thanked all involved with today’s success and underscored Arabsat’s continued growth as a leading satellite operator. Arabsat-6B, which will be renamed BADR-7 once in orbit and weighed some 5,798 kg. at liftoff, is the initial sixth-generation satellite for Arabsat’s fleet – providing broadcast, broadband and telecommunications services over the Middle East, Africa and Central Asia. Airbus Defence and Space supplied its Eurostar E3000 platform and handled satellite integration, while Thales Alenia Space supplied the telecommunications relay payload. GSAT-15 was the 19th satellite entrusted to Arianespace by the Indian Space Research Organisation – and the 18th built by ISRO. This productive relationship extends back to 1981 with launch of the APPLE experimental satellite, and further underscores the strong collaboration France and India have set up in space. With a liftoff mass of approximately 3,160 kg., GSAT-15 is designed to provide telecommunications services, as well as dedicated navigation-aid and emergency services, across India. While the emphasis was put squarely on the customers for today’s mission, Flight VA227 also continued a busy year of launch activity for Arianespace – which is on pace to perform a record 12 launches from the Spaceport using its Ariane 5, Soyuz and Vega vehicles, having now completed 10 so far. In his post-launch comments, Chairman and CEO Israël also paid tribute to Arianespace’s operational teams for their exceptional performance this year, while also giving credit to Ariane 5 prime contractor Airbus Safran Launchers. Arianespace’s next launch – its 11th this year – is Vega Flight VV03, which is scheduled for December 2 and will carry the LISA Pathfinder scientific space probe for its mission to study the ripples in space-time predicted by Albert Einstein’s General Theory of Relativity. Wrapping up the 2015 launch schedule – as well as Arianespace’s record pace of 12 flights in 12 months – is the 13th Soyuz mission since this workhorse Russian-built vehicle’s Spaceport debut in 2011. Designated Flight VS13, it will deploy two additional spacecraft for Europe’s Galileo satellite navigation system in mid-December. In addition to marking the latest operational achievement with today’s mission, Arianespace further strengthened its order book through new launch services agreements. It was announced at the Spaceport that ISRO selected Arianespace to launch India’s GSAT-17 and GSAT-18 telecommunications satellites on Ariane 5 flights from French Guiana in 2016 and 2017. Weighing approximately 3,400 kg. at launch each, the two spacecraft are planned as replacements for currently-operational relay platforms that provide key national services in multiple frequency bands. Separately, Intelsat S.A. confirmed that the first of its Intelsat EpicNG high-throughput satellites would be orbited by Arianespace aboard an Ariane 5 on January 27. Carrying an advanced digital payload, the Intelsat EpicNG will be the heavy-lift launcher’s sole passenger – a change from the typical dual-payload missions – and is to open Arianespace’s 2016 mission activity, according to Chairman and CEO Israël.